Kemang Cave Sembahe - A large stone covered with moss stands firmly on a piece of land. There is nothing special about this stone, there is the door and the room inside. On the outer walls of the caves are carved to resemble the shape of the human body but in small sizes, according to the body shape of the carving community is body size umang. 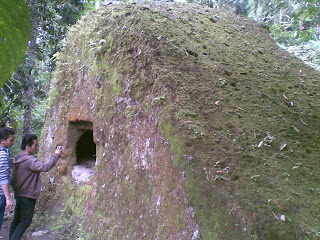 Local people believe as home Umang, the Bunian in Tanah Karo. Eventually, aided by cultivators the umang and his friend. The fields that should not be completed in one day go faster completion aided umang. This raises the suspicion that the wife cultivators so quietly wife cultivators to follow her husband’s field. Wife cultivators were surprised to see many creatures dwarf (umang) working in his fields. When the umang learned that the wife cultivators are the fields and see their activity, the umang an agreement with the cultivators was canceled. Which has a clean tilled fields, back into the wilderness. When the forest is cleared back a large stone was found and the room has a door in it and the stone is what is now referred to as a umang cave. “Umang” is Karo language which means genie or spirit. As told by Tolen Ketaren, such as human physical Umang, but smaller. The difference again, if running, his legs upside down, heel facing forward while his toes toward the back. Stone cave discovered by local people on this Dutch colonial era, once he was appointed to be moved to the Netherlands. But it can not be moved. Tolen himself did not know why this stone cave can not be removed. Maybe something to do also with magical powers. Most of the people believe that to this day still occasionally there that inhabit the rock cave. Uruk Rambuten village which is considered as the beginning of the village Sembahe medan tour is still recognizable. But there was no longer a resident who inhabit the village. Uruk Rambuten village located near the crash site Garuda Indonesia on 26 September 1997. According Tolen, there is the possibility of the plane crashed due to snagging banyan tree that grows in the middle of the village of Uruk Rambuten. Not hard to find the intersection Durintani. There is a signpost of cement contained in the intersection. “Site Cave Kemang (Batu Caves), Regional Office of the Ministry of Education and Culture of North Sumatra Province, Project Development Culture of the Provincial North Sumatra,” that is written there. It turns out that the rock cave is believed by archaeologists as relics of prehistoric man has become one of the government’s cultural sites. Park ever built and running by the Regional Office of the Department of Education’s 75 years in this place, but did not develop until now.